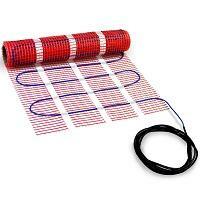 240V HeatTech mats must be used in conjunction with a 240V, 15A (max. load) thermostat in order to function properly. Among the compatible thermostats available on HeatTechProducts.com, are Honeywell’s TH115-AF-240S and TH115-AF-GA. The later is a 120/240V dual voltage model with built in GFCI for installation of the mat in humid locations (bathrooms, showers, etc. ).